Today I noticed something peculiar. In our garden, we have a spruce in which I have put a string of LED lights. 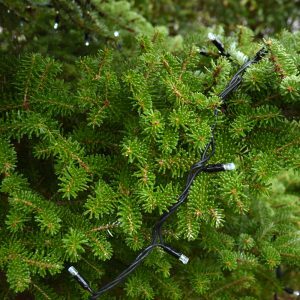 The lights are powered via a switch mode AC/DC power supply that creates the low voltage required by the LEDs from the mains voltage. 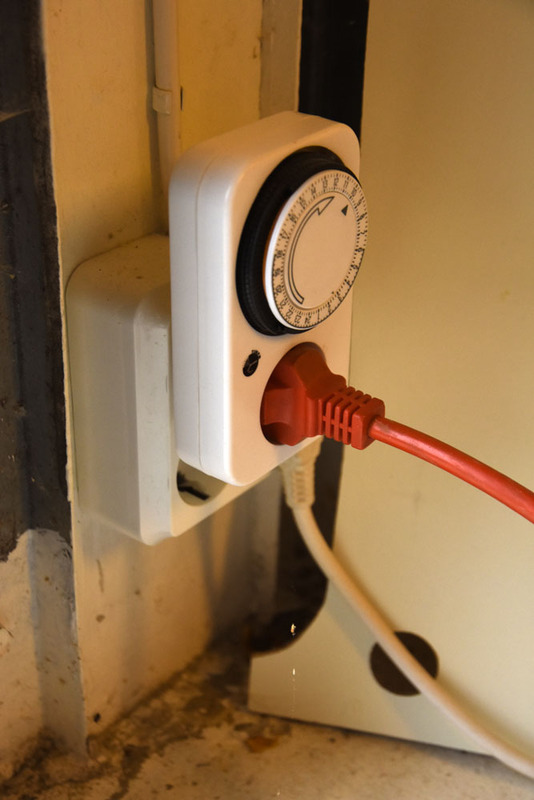 This power supply is connected to an extension cord and a timer inside the garage and I have set the timer such that the lights are on only while it is dark outside. However, the LEDs were mysteriously glowing dimly in the middle of the day when they were supposed to be off. Hmm, that is odd I thought. I did not think too hard about this at first, but a while later I realized what could cause this behavior. If the timer happens to be connected such that it breaks the neutral wire of the mains voltage instead of the live wire (phase), there could perhaps be enough capacitive leakage via the Y-capacitor going from neutral to protective earth inside the AC/DC supply such that the supply gets enough power to dimly light up the LEDs. Y capacitors are present in virtually all switch mode AC/DC supplies. They are connected between phase and earth as well as between neutral and earth. Their purpose is to limit the amount of unintended radio frequency noise generated by the switch mode supply that is radiated back onto the mains network. There is usually also an X capacitor for the same purpose connected between phase and neutral. In addition to the Y capacitor, there will also be leakage via the capacitance of the cable from neutral to earth as well as from neutral to the external world which currently consists of a quite wet lawn. But I would guess the leakage via the Y capacitor is much larger than the leakage via the cable capacitance. The equivalent circuit for the case when the timer breaks the neutral line is shown below. Equivalent circuit of timer breaking the neutral wire. The dashed arrow shows the flow of current from the phase wire, via the AC/DC circuitry in the dotted box, the CY2 capacitor and back via protective earth. 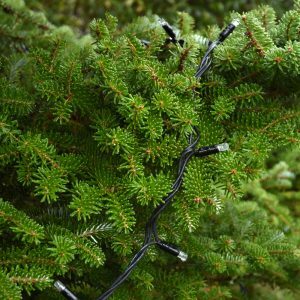 There will also be some current from from the neutral (disconnected) wire of the extension cord and the cable capacitance to the earth wire, CcableNE as well as a little current flowing in the capacitance from the cable neutral wire to the outside world (which as of this writing is a wet lawn). This capacitance is not shown in the figure above. So, a hypothesis about what is happening is fine, but how could I test this? Well, that is not too hard. Just rotate the timer 180 degrees in the wall outlet so that it breaks the other wire, which according to the hypothesis would be the phase. Equivalent circuit of timer breaking the phase (live) wire instead of the neutral. The rotation of the timer changes the equivalent circuit as shown above. Now the phase is stopped in the timer and no leakage can occur. The LEDs are completely off! After this maneuver, the LEDs in the tree were completely off, so the hypothesis seems to be correct. I would guess there are numerous similarly mysterious cases of LEDs powered via AC/DC converters connected to protective earth that light up dimly even when they are supposed to be off. The remedy is to make sure that the live wire is interrupted by the circuit breaker, rather than the neutral wire. 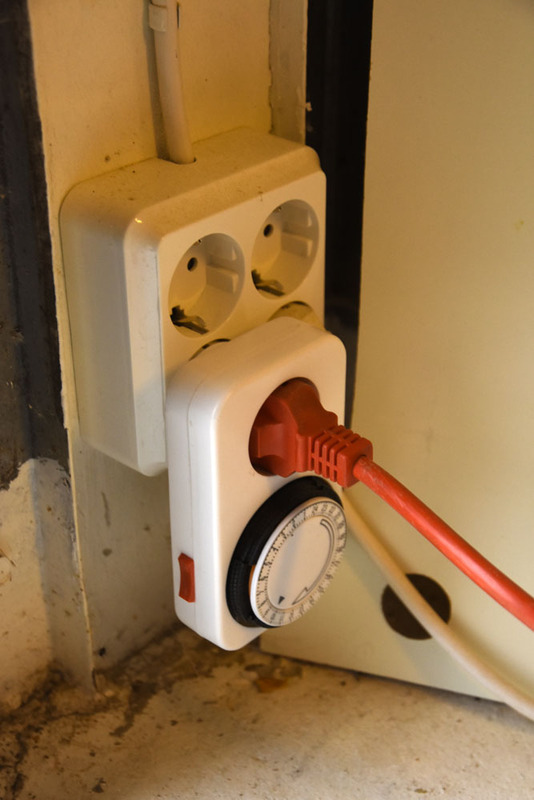 In installations connected to wall outlets, this can be done by rotating the plug (if you are in country where plugs with protective earth can be rotated). In fixed installations, it is necessary to swap which wire is connected to the light switch, which probably requires the intervention of an electrician.